Unfortunately, however, about two-thirds of third-grade children in the U.S. fall short of that reading proficiency goal. For these reasons, Age of Learning is a proud supporter of the Campaign for Grade-Level Reading, a collaborative, nationwide effort to ensure that more children in low-income families succeed in school and graduate prepared for college, a career, and active citizenship. 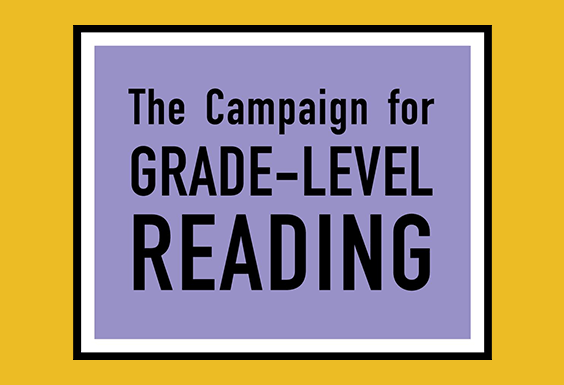 The Campaign for Grade-Level Reading focuses on an important predictor of school success and high school graduation—grade-level reading by the end of third grade. Led by Managing Director Ralph Smith, CGLR is supported by a broad range of public, private, and nonprofit sector organizations, including the Annie E. Casey Foundation, the David & Lucile Packard Foundation, the Robert Wood Johnson Foundation, the National League of Cities, United Way Worldwide, the Corporation for National and Community Service, the U.S. Department of Education, and America’s Promise Alliance. At the state and local levels, CGLR works with governors, mayors, school boards, superintendents, teachers, chambers of commerce, and many others. The Campaign for Grade-Level Reading invited us to present yesterday at their California Statewide Network Communities Conference in Sacramento, California, and share how Age of Learning’s Education Access Initiatives can support the work of the dozens of public and non-profit organizations in California that are working to meet the third-grade reading challenge with CGLR. Zac Katz, Senior Vice President of Corporate Development at Age of Learning, accompanied by Senior Curriculum Advisor Dr. Rebecca Palacios, described Age of Learning’s Education Access Initiatives and spoke about how ABCmouse.com is helping children to achieve critical early literacy goals. As Dr. Palacios has noted, the literacy gap that the Campaign for Grade-Level Reading seeks to remedy is a major chasm by the end of third grade, but the factors that contribute to that gap begin to have an impact much earlier. Research published in 2013 by Stanford psychologists in the journal Development Science suggests that some children are already behind by the age of 18 months and that 2-year-old children of low-income families may be six months behind children from higher-income families in language development. According to the often-cited Hart-Risley study, by the age of four, children from some low-income families may hear up to 32 million fewer words than other more affluent children. This very early language gap becomes a readiness gap when these young children enter school and a persistent achievement gap as they progress through school. To address this problem, the American Academy of Pediatrics, which represents about 62,000 pediatric doctors, recently issued a policy statement recommending that “pediatric providers promote early literacy development for children beginning in infancy and continuing at least until the age of kindergarten entry.” Their #1 recommendation is that parents start reading aloud to their children as soon as possible. For these and other reasons, language and literacy development have always been a primary emphasis at ABCmouse.com. If you’re interested, you can find out more about this in the ABCmouse.com Curriculum Overview. We look forward to continuing to support the Campaign for Grade-Level Reading and helping young learners build critical language and literacy skills. To learn more about our work in this area, visit our Education Access Initiatives page.